What a lovely gift to receive! A custom portrait of their own beloved pet and now you can order miniature portraits for as little as $60! 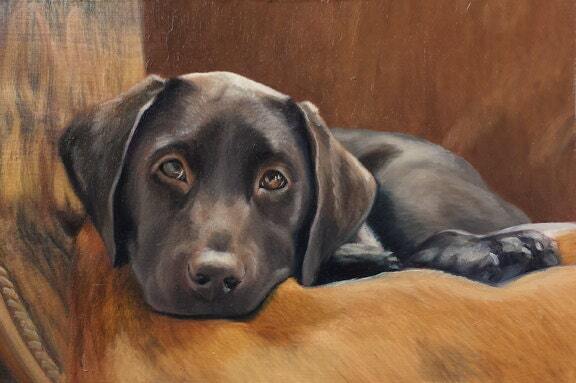 Commission a custom pet portrait of your special pets. My main goal is to be able to capture the true character and personality of your pet in your custom portrait. They make wonderful and affordable gifts, ideal for Birthdays, Christmas and other special occasions! I am so happy with the portrait that Melissa created of my parents’ dog, Sammy. When I ordered the portrait, Sammy was recently diagnosed with lymphoma. Shortly before the portrait arrived, Sammy passed away. Immediately when I opened the package, I burst into tears. Melissa truly captured Sammy’s personality through her painting. She kept communication with me throughout the process and was a pleasure to work with. Thank you Melissa!! I am so pleased with this picture of our sweet Bo. It is spot on and is so precious to have as a reminder of our boy. Melissa is an amazing artist. Melissa did an amazing painting of my boyfriend's very old dog. His family absolutely loved it. Melissa was friendly, approachable and professional throughout the whole process, and she is extremely talented. I highly recommend her work, it was a wonderful gift idea!